Process technology in beverage production is the intelligent interaction of individual components and systems, and it must address the widest range of requirements. Modern process technology is a key factor—i.e. to meet consumers' needs for quality, pleasure, variety and health benefits on the one hand and to give manufacturers innovative that allows them to work economically and flexibly and in a manner that conserves resources on the other. Exhibitors will present the latest product solutions that strike that balance at drinktec 2017, the World's Leading Trade Fair for the Beverage and Liquid Food Industry, which takes place at the Messe München trade-fair center from September 11–15, 2017. Shiny pipes, systems and apparatus made of stainless steel conceal the heart of beverage production: process technology. It forms the foundation for mixing and manufacturing a wide variety of beverages—i.e. both for established types of beverages and for a host of new developments. Product innovations in particular play a key role in the beverage industry. That is why process technology must be flexible. Large numbers of flavor variants and new combinations call for flexible technologies that are designed to deal with various options: New ingredients and recipes call for adapted processing steps or additional conveying and dosing processes. drinktec has traditionally been a trade fair of innovations and world premieres. It is where the future is made, especially when it comes to manufacturing solutions that are gentle to the products and flexible process control. “drinktec is a melting pot of the industry and a leading trade fair for us, both with respect to its size and significance. There is nothing comparable in any other country,” declared Anja Oltmanns, Marketing Manager at GEA Germany, after the last drinktec. So when it comes to process technology, what will await visitors at drinktec 2017? "The efficient use of resources is a must in beverage production. Whether it comes to water, energy or other media used in the production process, the choice of process technology determines resource consumption, and each and every component used can contribute to that," explains Richard Clemens, Managing Director of the Food Processing and Packaging Machinery Association in the German Engineering Federation (VDMA). The solutions that manufacturers of process technology for non-alcoholic beverages, juice and water have on display at drinktec include entire plants as well as individual units, e.g. for sugar infeed and processing, deaeration installations, carbonation plants and premixers as well as well as containers, tanks and chilling, heating and heat-maintenance plants. Other focal points include components for process technology as well as installations for measurement recording, pumps, fittings, pipelines and pigging systems. Microbiologically safe production calls for variable cleaning concepts that are implemented by introducing various CIP systems, for example. This also includes choosing the right type of water treatment. Should it be reverse osmosis, ultrafiltration or media filtration? These are questions that can be answered in discussions with the exhibitors. Thanks to collaboration with SIMEI, the trade fair for wine technology (see also press release dated August 6, 2015), the sector that focuses on process technology for wine and sparkling wine will also be complete as of 2017. Elaborate process technology makes it possible to gently process raw materials under production conditions that have been optimized for hygiene. Processes such as micro- and ultrafiltration ensure higher nutritional values—which has an immediately noticeable positive impact on consumers' health. After all, when it comes to beverage consumption, there is a growing focus on health aspects. That also includes the separate handling of juice and fruit pieces in process technology when dealing with extremely healthy and flavorful juices, which are available from several suppliers. It starts with product handling and continues until the bottling process. This is a good example of systematic thinking, which must cover each and every aspect of beverage production and is showcased by the all-encompassing range of exhibits at drinktec. Process technology will be addressed at the exhibitors' stands as well as in the fair's supporting program. That includes the drinktec Forum, where leading experts from research and practice will make presentations that examine the industry's future questions and take a look at the “bigger picture”. 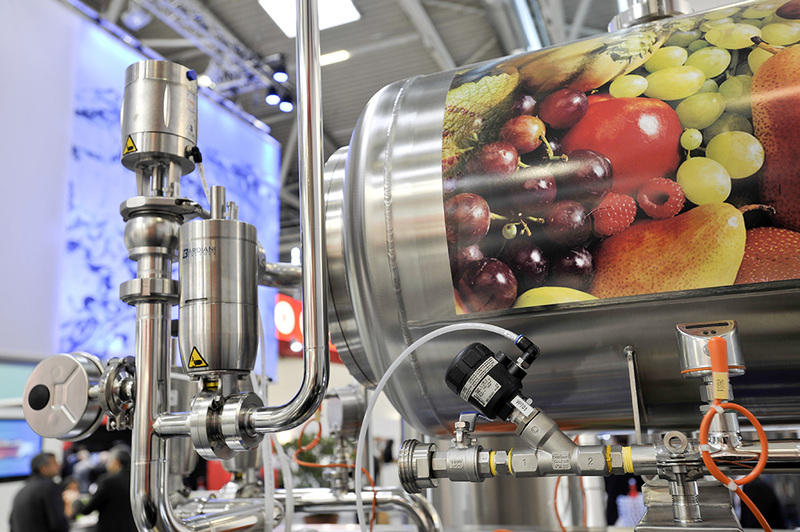 Process-technology specialists will also find the exhibition sector on “New Beverage Concepts” in Hall B1 interesting. The marketplace will allow manufacturers to introduce their latest sweetener, coloring and aroma strategies. Klaus Heitlinger, Managing Director of the Association of the German Fruit Juice Industry, is convinced: “drinktec is an absolute must for Germany's 350 fruit-juice manufacturers. Technical innovations for processing and bottling fruit juices are presented there for the first time. I'm talking about important processes such as high-pressure pasteurization or customized single-bottle printing. In short: Anyone who wants to see the latest developments in process technology must go to drinktec!” Process technology should be able to keep up with its own ideas. drinktec demonstrates how that can work.